Here’s a mouthwatering Freecharge Ola Cabs Offer for you. 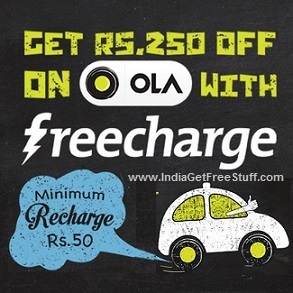 Just recharge for Rs.50 & above on the FreeCharge App and get Rs.250 off on any OLA cab ride. Hurry! =>NOTE: The OLA Cab coupon code will be sent as an SMS only to the number which you have recharged, within 10-15 mins. 1. Recharge your prepaid/postpaid mobile for Rs.50 or more using FreeCharge App. 2. Get an Ola Coupon Voucher worth Rs.250 via SMS on the recharged number within 24 hours. 3. Download Ola mobile app from Ola.bz/b . 4. Click on Apply coupon and enter the unique coupon voucher while booking the ride. 1. Ola vouchers are available only for unique numbers being recharged on FreeCharge App during the offer period. 2. Offer valid only on mobile recharge / postpaid bill payment of Rs.50 or more. 4. Offer is valid for Prepaid and Postpaid numbers only. The offer is not valid for DTH and Data card recharges. 5. The Freecharge Ola Cabs Offer is available on first come first serve basis, until vouchers last. 6. The offer is valid on all modes of payment. 7. The coupon code will be sent only via SMS on the unique mobile number recharged and not via the registered email. 3. Voucher is valid only from 22nd feb 2015 – 31st march 2015. 4. Applicable only on rides booked on the Ola App. 5. Cannot be clubbed with any other offer. 6. The Freecharge Ola Cabs Offer is not applicable on Kaali-Peeli rides and auto rides. 7. Cabs will be provided subject to availability. This website is very good. Posts latest offers always.